He waited by their house for a year, hoping they would come back — but he's doing so much better now. When Stewie’s family decided to move away, they left him behind — and the poor dog waited at their old house for a year, hoping that one day they’d come back for him. 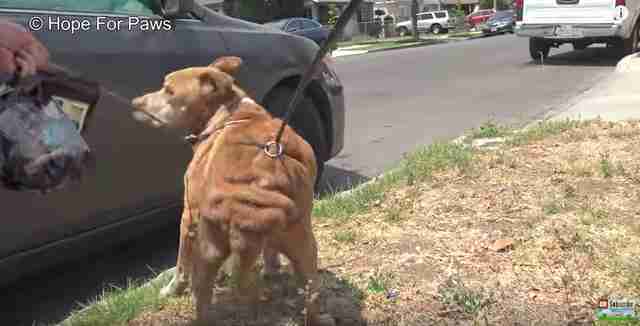 The 11-year-old pit bull mix was starving and scared for so long, just trying to make it on his own, until one day someone decided to try and get him help. … but as soon as he saw them he ran away, so sure that they were there to hurt him. … and they were right. 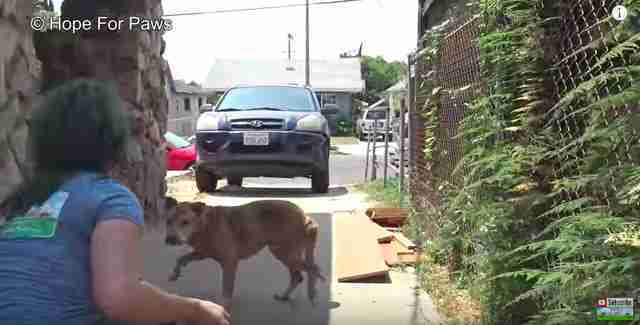 After a little while, Stewie came back to his house, and rescuers were able to quickly slip a leash over him, ensuring that the loyal dog was finally safe. Stewie was still pretty scared when his rescuers finally got him, and so they put him into a crate to keep him from trying to run away. A few neighbors helped lift the crate into the waiting car, and everyone was so overjoyed that Stewie was finally headed off to find the loving home he deserved. They quickly drove Stewie to the vet to get checked out, and after doing an X-ray, they made the heartbreaking discovery that the poor dog had been eating rocks during his time on the streets because he was so hungry. He also had masses all over his body that luckily turned out to be benign, and were all able to be removed. 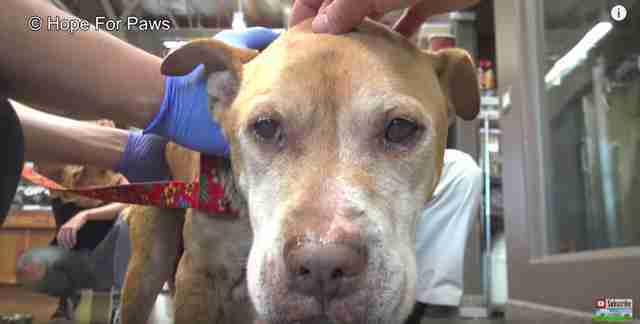 As he was checked out and cleaned up, the sweet senior dog began to warm up to his rescuers, accepting love and attention for the first time in a year. He seemed to realize he was finally safe, and would never have to resort to eating rocks ever again. Stewie is now in a fantastic foster home where he has lots of other dog siblings to play with, and people to give him all of the love he’s been wanting for so long. He may be on the older side, but he’s the absolute friendliest dog around, and just wants to find a forever home where he can snuggle and love for the rest of his days. If you’re interested in adopting Stewie, you can contact Grand-Paws Senior Sanctuary for more information.